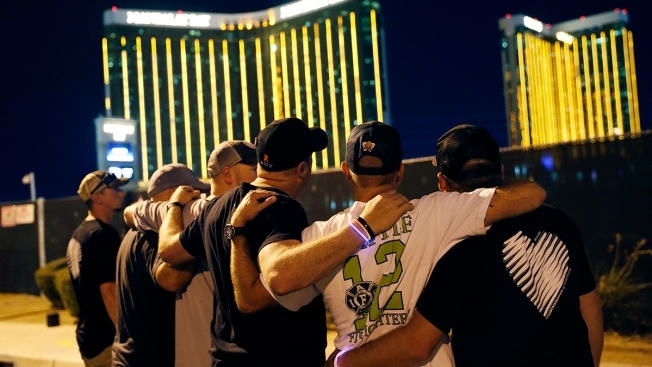 In this Oct. 1, 2018, file photo, survivors return to the scene of the Las Vegas mass shooting on the first anniversary. Hundreds of survivors of the Las Vegas mass shooting formed a human chain around the shuttered site of a country music festival where a gunman opened fire last year. The U.S. government is allocating nearly $17 million to help people affected by the Las Vegas Strip mass shooting that became the deadliest in the nation's modern history, Acting Attorney General Matthew Whitaker said Friday. Fifty-eight people died and more than 850 were injured when a gunman opened fire from a high-rise hotel into an open-air country music concert crowd of 22,000 people. Whitaker termed the $16.7 million grant to help victims, family members, medical personnel, first responders, concert staff, vendors and witnesses as an effort to help Las Vegas heal. "We have already provided $3 million to cover expenses for state and local law enforcement in Las Vegas and in Clark County following last October's horrific mass shooting," he said. The Justice Department said the money will supplement a $31.4 million compensation fund collected and spent by the Nevada Office for Victims of Crime . A committee overseeing the state fund created a protocol to make payments on a scale to more than 530 people. Relatives of those killed and people whose injuries left them with permanent brain damage or paralysis received the maximum $275,000. Smaller sums were given to those who were hospitalized or received medical care on an emergency or outpatient basis in the days after the shooting. One year after the Las Vegas shooting, NBC4 looks back on the stories of survivors. An FBI report incorporating a behavioral analysis of shooter Stephen Paddock is expected by year's end. Las Vegas police are still making weekly releases of video clips from hundreds of officers who responded to the shooting under court order in an open records lawsuit filed by The Associated Press and several other media organizations.